Community members welcome visitors to the savings group meeting at their church. Upon arrival in the community of Gorom, we were greeted at the road and led by procession and song to the church building where we would meet. The community selected 3 facilitators and had formed learning circles to teach basic literacy and numeracy skills. The facilitators were community members who could read and write and had the time to volunteer to serve their community. Because 80% of women in South Sudan missed out on education and are not literate it was not a surprise that the facilitators were men. The 3 men were, Angelo, Pierensio, and Oliver. Over time they formed 3 circles of learners with 32 women and 12 men. Today, all 44 participants have been accredited as literate and numerate. While the adults gained an education it became a priority for the community to build a small school for the children. They achieved this and Angelo and Pierensio went from being adult literacy facilitators to primary school teachers. Perhaps the cycle of illiteracy in the community can be broken! The 3 literacy circles of 44 learners combined in 2012 to form a single community Savings and Loan Association and called the association "Light". They were trained and mentored by Oliver and supported by their local chief Charles. While Charles is the local chief he joined the association led by a chairwoman with a female treasurer. Charles' membership in the group showed his support and endorsement. He soon became an even stronger example when he was granted a loan to increase his income making charcoal by opening a small shop to provide essential items needed in the community. In one year he earned 4 times the GNI per person for South Sudan. He gave half his profit to his wife to start a peanut paste business and uses his income to send all 9 of his children to school. Oliver described his work with the group and shared how they have come together so that every woman would have the opportunity to contribute to her family. He shared with us that each member saves 20 South Sudanese Pounds (SSP) or roughly 4 US dollars (USD) per month (before inflation and shortages of USD caused the exchange rate to spike). They also save 5 SSP each month for an emergency or social fund to support members of the community with medical or urgent needs. Charles added that if a member fails to attend a meeting they are charged 10 SSP. I found this a shocking amount and I asked how the group decided that penalty. He responded with a big smile and confessed that they had to speak with the missing member and hear from their mouth why they were absent before the penalty was imposed. But he insisted that the fine was important because, "if they do not attend they will not develop, and we want everyone to come up together". I found this to be an amazing witness to their commitment to each other and the value they placed on everyone in the community. Oliver went on to thank us for bringing this training and for not bringing money. He said, "even 1 million SSP would be eaten but this knowledge will stay with us always". 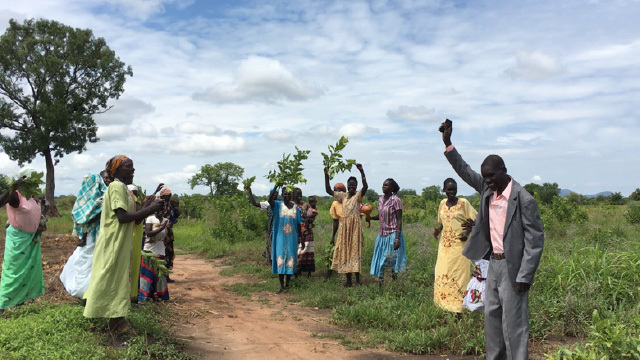 This was powerful testimony to a program that we hoped would transform the lives of women, their families and their communities in South Sudan. We found women and men working together, sharing new knowledge and leadership roles to improve their ability to provide for their families. We found a community working together and mobilizing resources to support the development of businesses important for the community as well as a new school. At the end of the meeting I greeted the Pastor and thanked him for letting us meet in the church and for his support for the program. He shared with me that the church we met in that day had been built by the community just as the school had been. He also wanted us to know that while he himself was blind, the Gospel was read every Sunday in the church by women from the literacy circles. Suzanne Middelton is the Programs Director for Five Talents USA.